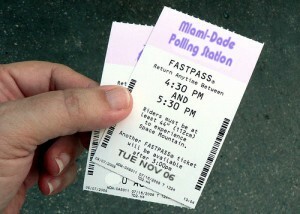 I bet Disney could help with the ongoing voting issues in Florida. Remember: new rules regarding the Fastpass dictate that you must arrive within an 8 minute window instead of the usual 14. * - All the rides in this sentence are actual Disney World Theme Park ride names.